New Council Member Tom Marvel (3rd from left in photo) was introduced. Mike Keller from Keller Mortuary presented to the Town on a request for a special use permit to allow the installation of a crematorium in his business on Main St. He stated that the system is smoke and odor free and sounds like an air conditioning unit when running. Deb Wainscott (President) wanted to see construction plans on changes to the interior and have the building inspector look things over before granting the request. An IDEM permit will be necessary later on in the process. The system will always be monitored and will require a 2-inch gas line. The cost to fix the Splash Pad is now believed to be $895.55 in parts. The Council approved using Park funds to pay for the parts and have the Town Utility Workers install them. The Town Council denied a request to reimburse residents for refilling swimming pools after discoloration in the Town water system. 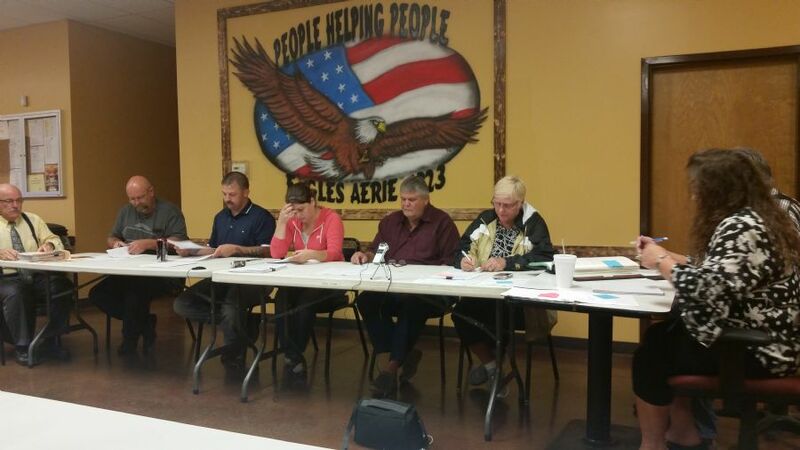 Amy Speaks and representatives from ATT discussed bringing fiber internet to the Town of Lapel for Businesses only. Next week they will be going to the 92 businesses in Town to ask them if they are interested in high speed internet from ATT and to possibly sign a "Letter of Intent" - while there will be no build out cost to the businesses the end monthly cost of the service is likely to depend on the number of businesses that are interested. The Town Council voted to give new employee Greg Lucas a pay raise, he will now receive $12 per hour. The Town Council discussed the expected cost to install a gas main to 650 South to allow the Town to be positioned to provide gas services to new developments along the SR13 corridor. USDI has given an estimate of $240,000 for materials, equipment and labor to run the gas line from 400 South to 650 South. Due to the high cost the Town will need to bid the project out and hopes to space construction out over several years.